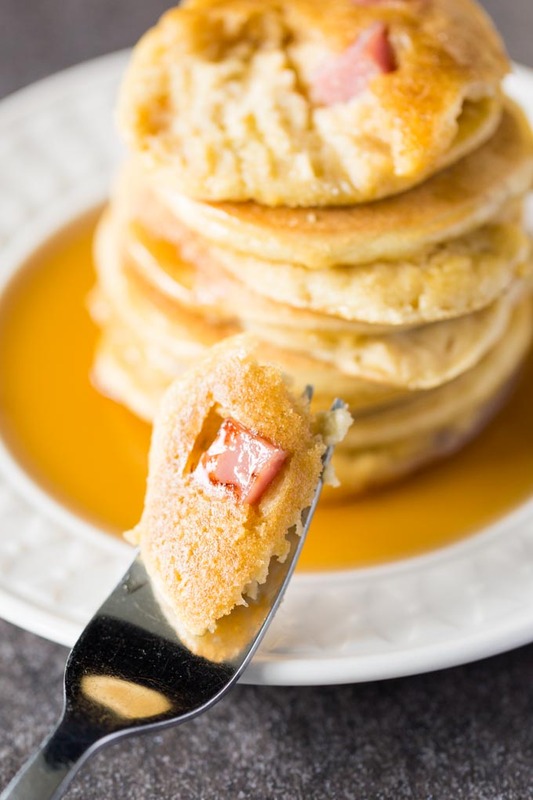 Silver dollar hamcakes are tiny pancakes with ham! 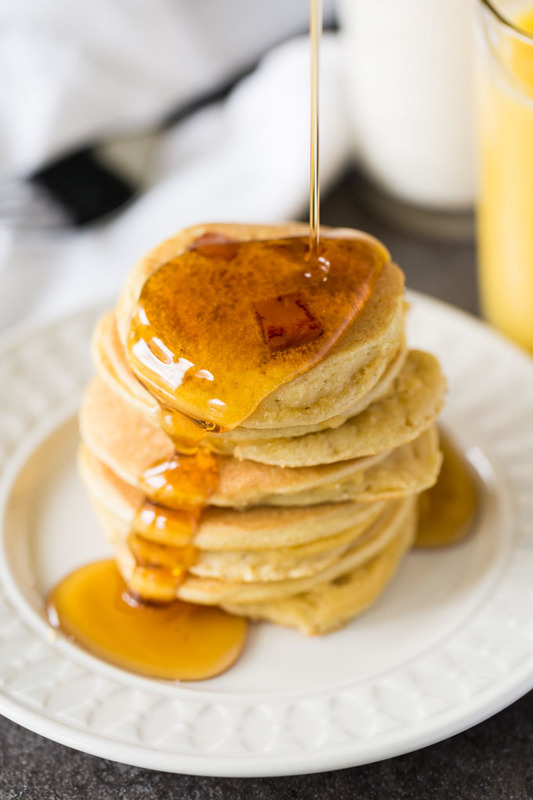 These miniature sweet and savory pancakes are equally delicious for breakfast or dinner. 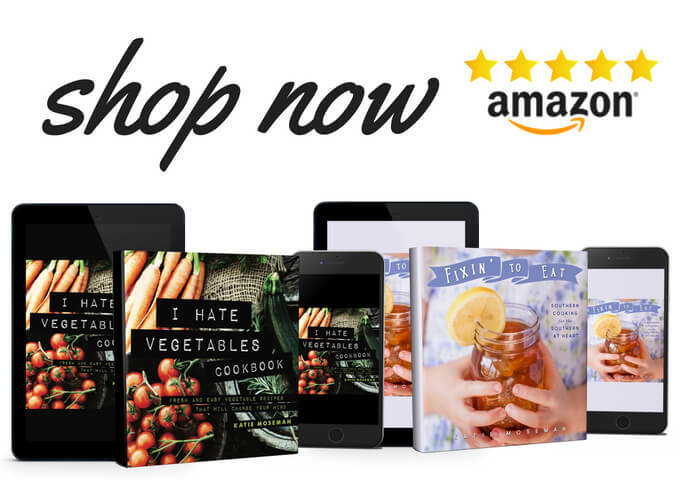 How many different ways can you play with the flavors of sweet and savory? There’s salt and caramel. Pretzels and chocolate. Bacon and maple syrup. Let me add to this glorious pantheon: Pancakes and ham! You’ve enjoyed them separately, but together, they are the Fred and Ginger of the breakfast table. All you need are pancake ingredients and a handful of cubed ham. 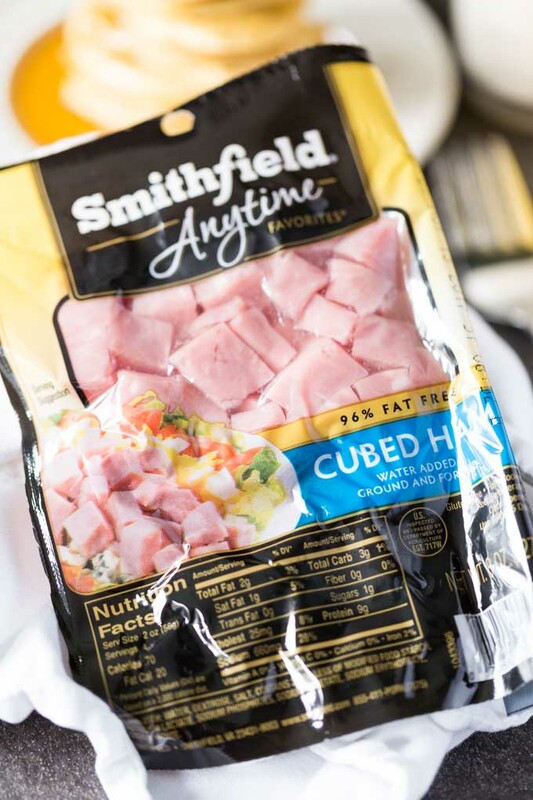 I used Smithfield Anytime Favorites Cubed Ham, which comes conveniently packaged and ready to incorporate into all kinds of recipes. Adding ham to breakfast boosts your protein intake, which will help keep you sharp throughout the day. Smithfield products like Anytime Favorites ham, bacon, and fresh breakfast sausage are perfect for balancing out your morning meal with a protein boost. Personally, I need all the morning boosts I can get, or I start doing interesting yet entirely unsuitable things like putting on my shirt inside out or writing on a white board with permanent markers. It’s not surprising that No Kid Hungry found that breakfast has a dramatic effect on school performance. Students who eat a school breakfast score 17.5% higher on standardized math tests. Because of this, Smithfield is partnering with No Kid Hungry (an organization that combats childhood hunger) to donate one million meals* to kids in need across America. You can help! For every Smithfield breakfast product purchase, Smithfield will donate one meal to a child in need. Share a picture of your Smithfield breakfast** on Facebook, Twitter, or Instagram, and tag it #breakfastpower, and Smithfield will donate a second meal on your behalf. 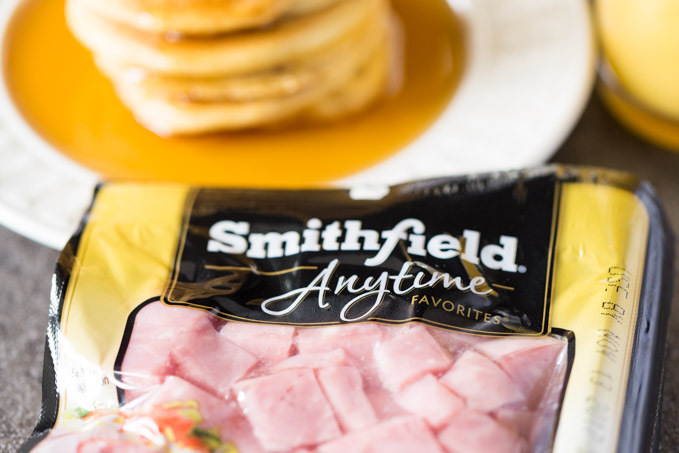 This promotion only lasts until October 31, 2017, so pick up some Smithfield Anytime Favorites Cubed Ham and share your breakfast today to help feed kids in need. Now that you’re inspired, here are some fun variation ideas for this hamcake recipe. Add a little sprinkle of cheese when you add the meat: try cheddar, Colby, or Monterey jack. Make a miniature sandwich! Broil a piece of cheese over your finished hamcake, then top with another hamcake. It’s a handheld breakfast delight. Try different toppings. 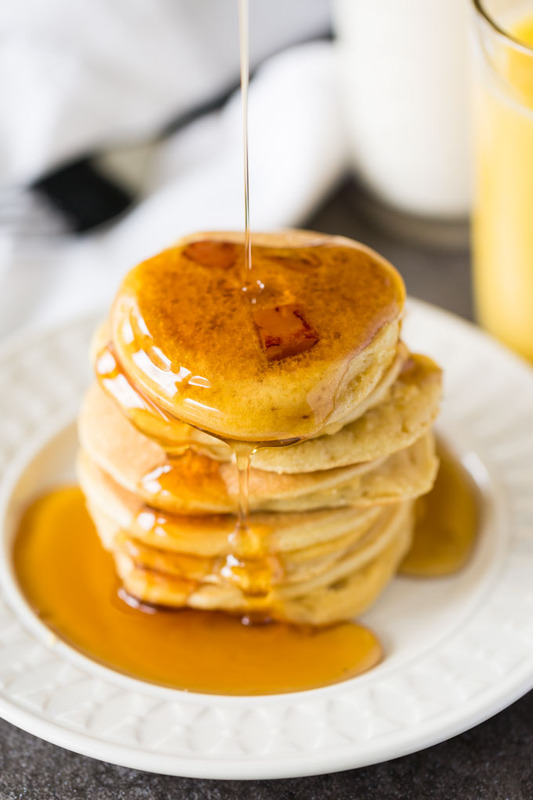 Maple syrup is an obvious pairing, but how about a varietal honey? Or spread your hamcake with cream cheese, or strawberry jam. Think of it as a breakfast Monte Cristo. Pour the mixture of wet ingredients into the mixture of dry ingredients and whisk until combined. Scoop up 1/4 cup of pancake batter and pour it in the pan. Repeat, adding a few more mini pancakes to the pan. Then add three pieces of cubed ham on the batter of each pancake, pressing in lightly. Cook until there are many bubbles on the surface of the batter, and the edges become firm (about 60 to 90 seconds). Flip the pancake and cook for another 30 to 60 seconds, then remove to a plate. Repeat until batter is used up. 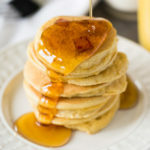 Stack all the cooked pancakes together to keep them warm, or serve immediately as they come out of the pan. *Visit nokidhungry.org/onedollar to learn more about how every $1 donated connects a child to 10 meals. Previous Post: « Why Are They Called Slutty Brownies? I love sweet/savory stuff and I like the idea of making a breakfast sandwich with these.